Do you want to change the category base prefix in WordPress? By default, WordPress automatically adds /category/ as a prefix to URLs for all category pages. 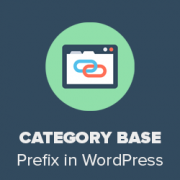 In this article, we will show you how to change the category base prefix in WordPress. We will also talk about whether or not you should remove the base prefix altogether. What is Category Base Prefix? Should You Change It? Each category on your WordPress site get its own page and RSS feed. You can view all posts filed under a category by visiting that category archive page. By default, WordPress adds ‘category’ as base prefix to URLs for category pages. This helps differentiate pages and posts from category and tag archives. Similarly, WordPress also adds tag prefix to URLs for tag archives. This SEO friendly URL structure helps users and search engines understand what kind of page they are visiting. Most websites don’t need to change the base prefix at all. However, if you are creating a niche site where you would like to use a different word or phrase for your categories, then you can change the category base prefix to reflect that. Changing category base prefix is quite simple in WordPress. You need to visit Settings » Permalinks page and scroll down to the ‘Optional’ section. Here you can enter the prefix you would like to use next to the category base option. You can also change the tag base prefix if you want. If you are changing category base prefix on a new website, then you don’t need to do anything. However, if you are doing this on an existing website, then users visiting the old category page will see a 404 error. To fix this, you will need to setup redirect to make sure both search engines and regular visitors are properly redirected to the correct category page on your site. First you will need to install and activate the Redirection plugin. For more details, see our step by step guide on how to install a WordPress plugin. Upon activation, you need to visit Tools » Redirection page to setup redirect. Scroll down to ‘Add new redirection’ section. First, you need to add /category/(. *) in the source URL field. After that you need to check the box next to the regular expression option. In the target URL field, you need to add your new category base prefix like this /topics/$1. Don’t forget to replace topics with your new category prefix. Click on the ‘Add Redirection’ button to save your changes. That’s all. Now all your users and search engines will be redirected to the correct URLs using your new category prefix. This is not a good idea, and we recommend that you do not remove category base prefix. Category base prefix helps both users and search engines distinguish between posts/pages and categories. Removing the prefix makes your URLs ambiguous which is not good for user experience or SEO. You may also run into technical issues with various WordPress plugins. For example, if you have a category and a page with the same name or when you are using %postname% as your URL structure for single posts, then your site will experience infinite redirect loop causing the pages to never load. However, if you still want to do this, then you need to install and activate FV Top Level Categories plugin. For more details, see our step by step guide on how to install a WordPress plugin. The plugin works out of the box and will immediately remove the category base prefix from your category URLs. 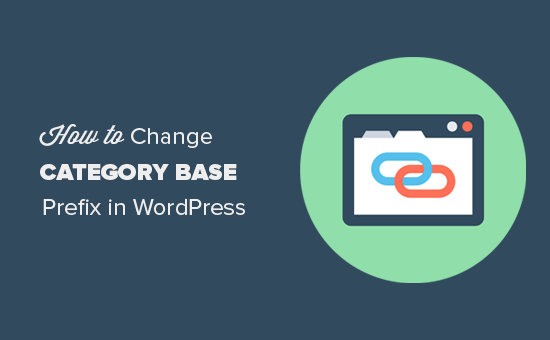 We hope this article helped you learn how to change the category base prefix in WordPress. You may also want to see our list of most wanted WordPress tips, tricks, and hacks. When i set “Category base” with “%category%” in permalink it works fine but all other posts and page going in 404. I have to set “Category base” with “%category%”. How can it be achieve? 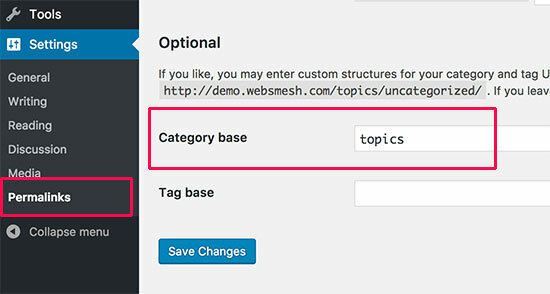 I want to change “category” base in “news” as well as “tag” into “topic” on a WordPress website. 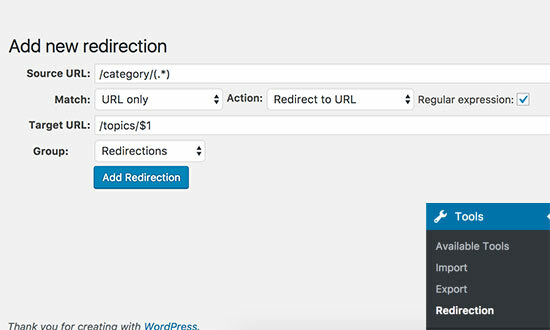 Will this method work in Yoast redirects as I don’t want to use a separate plugin? Instead of having URL.com/tag.. I want to change it to URL.com/category/tag but I can’t seem to do this. Can you easily explain how to achieve this? Hi there. Great article. I’m looking at doing something similar, but I’m not changing the category or tag base. I’m changing the base of “portfolio” pages. There isn’t an option to edit the case in the permalink settings. Is there another way to edit bases in my wordpress files? How to add a custom text to tag url slug? I don’t want to go with a single tag slug edit. I want to append “-help” to all existed tags slugs and upcoming tags. so far the only solution I can think of is a 301 redirect in htaccess but I’m looking for something smoother…. I’ve found a somewhat odd way of removing the category part. Just to explain, I’m creating a portfolio site with a category called ‘blog’ for blogposts / latest news and one called ‘work’ for completed design projects. Obviously the desired effect is to have the url as example.co.uk/blog (or work) rather than example.co.uk/category/blog, which looks just a bit naff I’m sure you’ll agree. By simply putting a full stop in the category base entry field WordPress seems to ignore this requirement in the url and creates the leaner, cleaner version that was wanted. Has anyone else seen this before? Do they know of any issues with it? I’m just getting to grips with WordPress having taught myself HTML, CSS and PHP, so I’ve only tried it on a local setup and with the twenty eleven theme. This is an interesting approach. Did you consider using category archive templates, like category-blog.php and category-work.php? After using these templates you can use WordPress seo plugin to remove category slug from url and you will get your blog posts on example.com/blog and Work posts on example.com/work. i am use another category page will get a 404 (not found) error when trying to access the page again. In this blog did you have problems? I can see that you remove the category base and looks pretty good. Could tell us how you do this? If you are using WordPress SEO you can go to SEO » Permalinks check the box that says Strip the category base (usually /category/) from the category URL. I guess you are using such feature too. I worry that I will lose ranking if I “unstrip” the category in the URL. Any suggestion for this? Thanks to SEO plugins like yoast, they have added an option for this on their current version. Thanks for the info, this is a quick and simple, although often overlooked way to sort the category and tag base issues out..
To entirely remove the Category base I used to use a plugin called WP No Category Base which worked well, but can cause problems when you have a page and category with the same name – E.g. Page = Hosting (domain.com/hosting/) and a Category = Hosting (domain.com/hosting/) – but using .html suffix may help — but there are bound to be implications. I always like to use the .html suffix as well as changing the prefix – thanks for sharing – a simple but effective technique! If you want to do this, you should probably do this right when you begin your blog. page will get a 404 (not found) error when trying to access the page again. Some SEO plugins handle this case and give a 302 (redirect) status when you change a permalink, but I’m not sure about tag URLs. I didn’t know that it was so easy to change.